San Francisco-based creative design agency All of it Now used Epson large venue Z-Series high-lumen projectors for New York’s Museum of Food and Drink latest exhibit called “Chow,” which celebrates the birth and evolution of Chinese American cuisine. 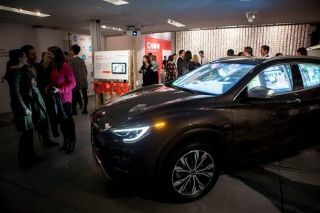 The exhibit features the first-ever 2017 INFINITI QX30 premium active crossover, where individuals can utilize the interactive iOS application podium to select a culinary journey through one of five exciting cities. Each journey profiles important dishes and restaurants that contribute to the neighborhood’s culture using the car's windows as a canvas. All of it Now was tasked with the installation, requiring the technical skills to mate iOS development with advanced projection mapping and media playback. Creating a screen on the curved structure of a car presents various challenges solved only through advancing graphics and projection technology. To create an immersive environment, the installation required the automobile front and side windows to be transformed into vibrant HD displays. This was particularly challenging due to the need for frame synchronization between displays, as well as the computational requirements for a combined resolution output of 5760 x 1080. The Epson Z series projectors were selected as essential tools for success on a glass canvas in an environment with high ambient light. In addition, the flexibility of lensing and image adjustment was crucial in minimizing venue space requirements. All of it Now utilized a total of 3 Epson Pro Z10000’s, each delivering a supported resolution of 1920 x 1080. The wide array of available lenses allowed for perfect placement of projectors based on venue needs and space limitations. The thin profile and low weight of these units maximized screen brightness without sacrificing height clearance or increased venue modification costs. The cherry on top is the availability of white units, which blended into the venue’s decor, creating museum-grade installations without distraction. Most competitors offer only black projectors, while Epson’s availability of both black & white color choices allows for camouflage in any environment. All of it Now developed a custom iOS application for the project, allowing the user to select from 1 of 5 locations, giving additional information about each location, as well as acting as a control surface for the user to activate each experience. The app recorded daily usage metrics, and offered lead generation when the user requests additional sales materials. The application was developed to be cross-platform so that any type of mobile, tablet, or computer device (iOS, Android, OSX, Windows, etc.) can view the application without limitations on formatting or behavior. Creating dynamic apps this way ultimately increases value for both users and agencies alike, reducing development costs and enabling flexibility of rollout on any type of device. The contrast between interactive automotive projection and culinary history is a striking parallel to the tension in New York between rapid technological innovation and deep rooted traditions. The Museum of Food and Drink rightly serves as an ideal host to exhibits illustrating the rich, international culture of Chinese American cuisine.